The source of inspiration of the extremely high-quality chin-up barTrollveggen originates from the untouched Scandinavian nature. The sturdy birch plywood frame is combined with a hard and stabile stainless steel bar, which resists well and sturdily while doing diverse chin-up variations. 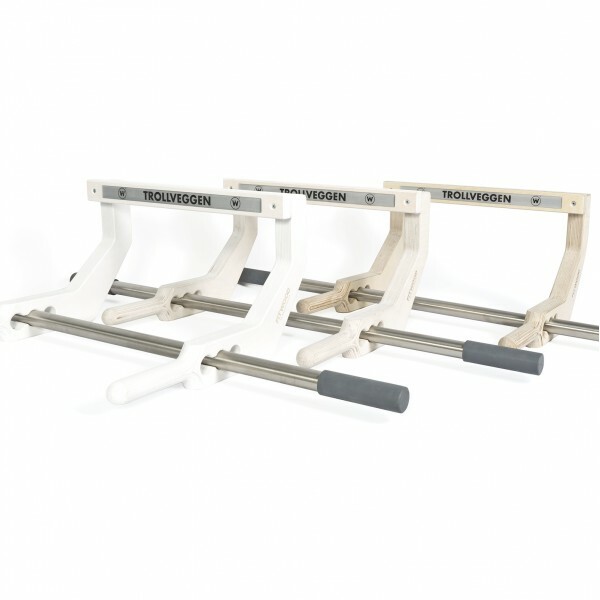 The Trollveggen chin-up bar can be mounted on three different positions. Hence, the precious fitness gadget can be mounted on almost all wall thicknesses. The nice plywood direct handles have a big diameter of 32 mm. The 100cm long stainless steel bar has rubber pads on both handle ends in order to protect the door frame and to absorb points of contact. The sturdiness and stability of the Trollveggen bar offer ideal conditions for the effective upper body training at home. In addition, the stylish chin-up bar offers the advantage that it is easy and esthetic to integrate in your interior design.